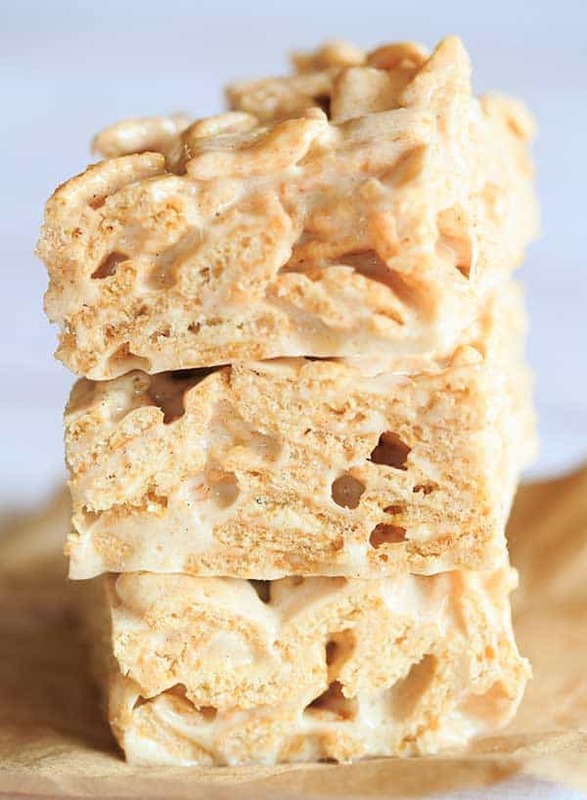 A riff on the popular Rice Krispie Treats… a marshmallow cereal treat made with Cinnamon Toast Crunch cereal. Since I can remember, I’ve been a huge fan of Rice Krispie treats. I love them homemade, I loved the cereal back in middle school, I love the massive ones you can get at Noodles… and I love coming up with new creations in my own kitchen. Some of my favorite are A, B, C and D… and I love playing around with different cereals, as well. Case in point: Golden Grahams s’mores bars. I’ve been seeing tons of recipes pop up recently featuring Cinnamon Toast Crunch… everything from milkshakes to fudge, and it totally got me craving one of my favorite cereals. It’s my husband’s favorite as well, so I had a feeling that these Cinnamon Toast Crunch marshmallow treats would be hugely popular in our house. These are ooey, gooey and I was supremely impressed with the fact that the cereal stayed nice and crisp in their bed of marshmallow sauce. We are a house divided when it comes to cereal – I use a minimum amount of milk and eat it quickly, as I like it stay nice and crispy. My husband drowns his cereal in milk and lets it sit until it’s nice and soggy. 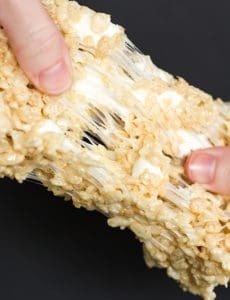 As a crisp cereal person, I loved that these marshmallow treats kept that signature crispy texture. 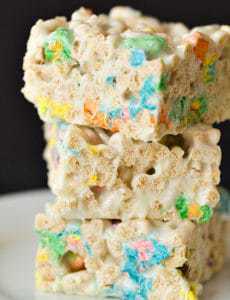 If you love your Rice Krispie treats and are a fan of Cinnamon Toast Crunch, you absolutely have to make these marshmallow cereal treats! 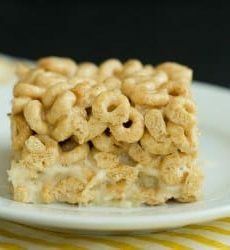 A riff on the popular Rice Krispie Treats... a marshmallow cereal treat made with Cinnamon Toast Crunch cereal. Line a 9x9-inch square pan with parchment paper. In a large pot, melt the butter over low heat. Once melted, add the marshmallows and stir constantly until they have all melted. Remove from the heat and stir in the cereal until it is completely coated with the melted marshmallow sauce. Turn the mixture out into the pan and, using a spoon or spatula that has been sprayed with non-stick cooking spray, press into an even layer. 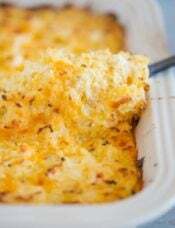 Let sit at room temperature for at least 30 minutes, then cut into squares and serve. Leftovers should be stored in an airtight container at room temperature for up to 3 days. I just made this with my mom and it is amazing!! Five stars all the way! 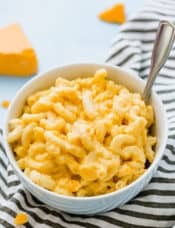 This recipe is a true hit with EVERYONE that tries it! The ratio is perfect and the treats are AMAZING!! They’ve become a request for all fun occasions!! Thank you for sharing!!! Has inspired me to try other cereals too 😊 happy baking!! The mixture seems to really be sticking to the bottom of the serving dish. Did we noy cook the marshmallows down enough? Hi Katie, Did you grease the dish? As long as the marshmallows are melted, you don’t need to “cook” them any more. Crazy delicious! 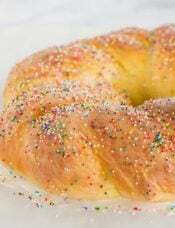 Way better than regular Krispy treats. Stored in airtight container but they were kinda soft and not as crispy the next day. So I would suggest making and serving the same day. 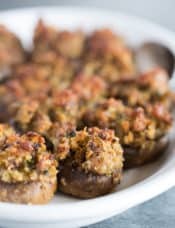 Made these tonight and my family all said “these are so, so good”! And they really are! Will stock up on the cereal so I always have the ingredients ready to make them. I think the next time I make Rice Krispies squares, I will add some cinnamon to the melted butter/marshmallow mixture because these were so good! Thanks for the recipe. I made these last night! 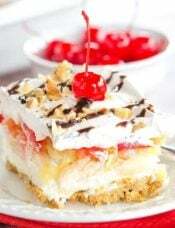 OH MY YUMMY! I love them so much better than the Rice Krispy treats. I used foil instead of parchment paper – BIG mistake. They stuck to the foil pretty bad. Lesson learned! I totally plan to make these for my super-picky but cinnamon toast crunch-loving son. Can you tell me what size or how many bags of mini-marshmallows convert to 8 cups? Or perhaps the equivalent weight (in ounces)? Thanks! Hi JB, It’s about 1.5 (10-ounce) bags. Hope that helps! Michelle – how can you stand the overwhelming cuteness of that little boy! You can see his personality shining on his face! And as always, your furry boys are precious. 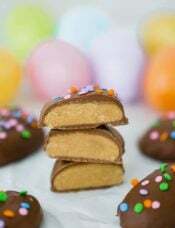 Thanks for the yummy recipe – I have my oldest son and grandson coming this weekend to visit – I just may have to make these! Oh, what a big boy Joseph is becoming — so cute! I definitely enjoy seeing all of his pictures. However, you have lost me on the Marshmallow treats, Michelle, because they have never ever been my favorites. However, I’ll take a few of those chocolate chip cookies that you mentioned that you were baking :) :), which reminds me that I promised my DH that I would bake him a batch once our latest heat spell broke here in Pittsburgh, and it most certainly has broken — thank goodness! Have a great weekend, everyone! I was just recently thinking what other cereals could I drown in marshmallows… Thanks for sharing! These look truly decadent. I loved cinnamon toast crunch as a kid. Truth be told, I’d love it now too but I don’t buy it for fear that I’d eat an entire box in only a couple of days! Rice Krispies treats are the only reason I go to Noodles. I’m pretty much a traditionalist, so the originals are my favorite and I’m not likely to try variations. However, several years ago Martha Stewart had a recipe that used 1/3 each Rice Krispies, Lucky Charms and Froot Loops. I don’t like Lucky Charms, so I used half Rice Krispies and half Froot Loops. They were pretty good! But the originals are still the best. These are gooey perfection, Michelle! Yum! I have a weakness for krispie treats! YUM! I never would have thought to make krispy treats with Cinnamon Toast Crunch! These are so much fun and I am obsessed with all of that ooey gooey marshmallow-ness! What a fun take on rice krispy treats! Yes, 9×9! I think a 9×13 would be too thin. O M G! These look amazing! 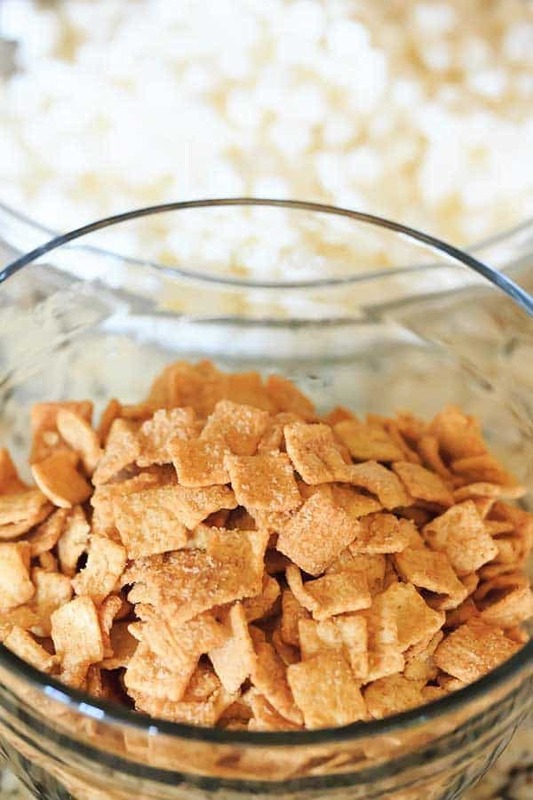 Cinnamon Toast Crunch is our household favorite too!